Your heart is now working twice as hard as it normally does, putting out blood supply for the increasing requirements of your vital organs. It equates to approximately 6 litres of blood per minute. Unfortunately this increased blood volume can have some side effects that will last for the duration of your pregnancy such as nosebleeds and nasal congestion. Changes in hormone levels also contribute to cause swelling to the mucous membranes in the nose. Increasing your vitamin C may help as nosebleeds are often due to a vitamin C deficiency. See your doctor if you continue to have problems related to nasal congestion and nosebleeds for recommendations. By 16 weeks of pregnancy you may have gained anywhere from 2.2 to 4.5 kilos, this weight is generally higher if you have not suffered from morning sickness. Due to your uterus expanding and the ligaments stretching in your abdomen you may feel some slight pains that are generally temporary, however if you are concerned speak to your doctor. Generally around week 16 expecting mums might consider hitting the shops for some maternity clothes. You might not actually be able to fill them out properly for the next few weeks you will most likely find the change in clothing a relief on your growing tummy. Provided you have not gained an unusually high amount of weight, your maternity size will be the same size you were before you got pregnant. Baby belly belts are another option in the mean time to adjust and extend your wardrobe to get the most out of the clothing you already own to keep you covered and give you the stretch you need. Your baby now has the same number of nerve cells as an adult. Some of these nerve cells that extend from the baby’s brain begin to be coated in a protective layer of fat called myelin. This is an extremely important part of your baby’s development as the passage of messages can be sent to and from the brain. Further connection of nerves to muscles mean that your baby’s limbs can move freely around their joints, with the muscles being stimulated to relax and contract; however these movements are not under the control of the baby’s brain. The baby is not yet big enough to activate the nerve endings on your uterine wall; therefore you will not notice the kicking and stretching of the baby’s limbs. Other movements might start to be felt in a fluttering sensation, however it may still be a few weeks before you feel this quickening. Don’t panic if you are a first time mum, generally you are less likely to feel the movement early on in pregnancy compared with someone that has had a baby before. Your baby’s eyes are now in position and have fully formed eyelids that will remain closed until the sixth month. The eye colour will change similar to your baby’s hair colour. 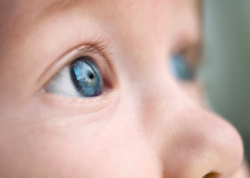 However, generally a baby’s eye colour is determined by genetics, although the production of melanin can change a baby’s eventual eye colour. Some babies are born with blue eyes that get darker and darker during the first few months and change colour due to the amount of melanin increasing from birth. Just because both parents have brown eyes does not mean that your baby will have brown eyes. Certain combinations of course increase or decrease the chances of a certain outcome; however nothing is ever 100% certain. Some pairing of each gene, called alleles are more dominant than the other, but a child may inherit a recessive allele from both or one of the parents. At 16 weeks as your baby’s head beings to straighten out slightly the baby measures about 11.5 cms long from crown to rump and weighs approximately 100 grams.